Gillette has partnered with YouTube to launch a football channel to make highlight content from various football leagues available globally. 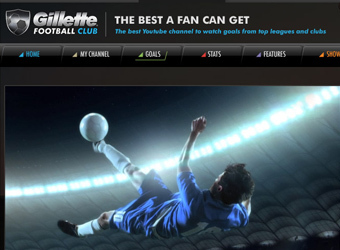 ‘Gillette Football Club’ aims to reinvent the way people watch football online by aggregating highlights, news, statistics and behind the scenes footage from the top football leagues and clubs, as well as new and exclusive content. It will cover top leagues like Spain’s La Liga and Italy’s Serie A, over 50 different clubs, including Manchester City FC, Chelsea FC, Paris Saint-Germain and Olympique de Marseille, and news from sports content providers such as TalkSport and ESPN. Currently launched in beta mode with plans to roll out to Australia soon, the YouTube channel is free to sign up to and allows viewers to select their favourite leagues and clubs to have the latest videos delivered to them upon upload. The platform will also feature exclusive content created by production company Big Balls, player performance analysis provided by Squawka, and popular social football game I AM PLAYR. The move will see Gillette become the main sponsor of football content on YouTube in Europe, Middle East and Africa, and add to the partnership the FMCG firm has with charity streetfootballworld by donating one dollar for every registration to the club up to a limit of US$300,000.